Cut Down on Spring Allergies by Washing Your Air with Venta Airwasher! After a brutal winter that left my skin totally ruined, cracked and dried, it’s finally spring! You know how I know? Because my eyes itch and I can’t stop sneezing. Yep, spring. It’s here. Along with spring allergies! While I didn’t really have a great weapon against dry air over the winter (aside from an arsenal of lotions), I have the coolest air purifier on the planet now. It’s a Venta Airwasher (which I received in exchange for an honest review). Doesn’t it sound fancy? Like a luxury car? What on earth is the Venta Airwasher? Let’s answer that question first, shall we? I had the same one. Airwasher? What do they mean? Is it an air purifier or a humidifier? If it’s a humidifier, why would I want it during the spring and summer months? One question at a time! The Venta Airwasher is BOTH a humidifier and an air purifier. Basically, it pulls the air in, washes it, then sends it back out. I cannot even begin to explain the process without using words like “white spinny things” and “super special solution,” so how about we let the video explain it instead? Pretty cool, right? Want a closer look at those “spinny things”? Here ya go! It works super well and incredibly quietly. With many air purifiers, I have to turn the TV up loud to hear over them. Even on the highest setting of my Venta Airwasher LW45, it’s barely louder than a small desk fan. Plus, there are no filters to replace, so you’re not paying a small fortune over and over to keep it working. So we learned that the Venta Airwasher is in fact a humidifier as well as an air purifier. What do you do with it in the summer months, then? I mean, it’s already hot and humid out, right? Well, for those of you running AC, you keep on running your Venta Airwasher! Air conditioning is just as drying as your heater. Don’t believe me? Drive around in your car with the AC on for a while, then drive around with the windows down. You’ll notice a big difference in the moisture on your skin. How about those of us without central air? We have an AC unit in one of the rooms that cools most of the upstairs. During the summer, I’ll move the Venta to the upstairs part of the house. It will help cut down on allergens in the bedrooms so we don’t wake up feeling miserable. A lack of adequate moisture in the air can lead to all sorts of problems, including fatigue, headaches, nosebleeds, difficulty concentrating and more. Plus it also wreaks havoc on your wooden furniture! 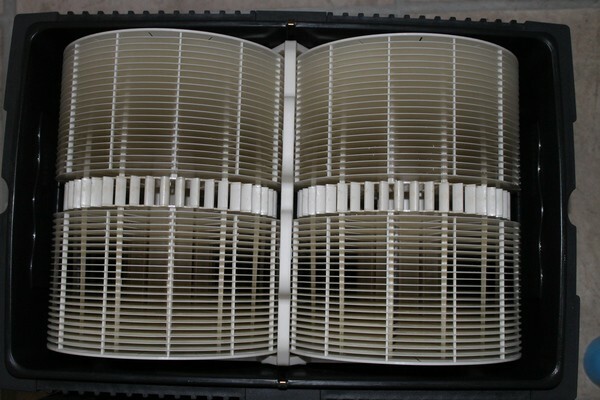 One thing I think is really important to mention about the quality about the humidity that comes out of the Venta Airwasher: it’s not that sticky “wet” stuff that you get from a standard, inexpensive humidifier. It doesn’t leave everything in the room coated with dew. I don’t know how to explain it. You would think that moisture is moisture. Except it’s not. 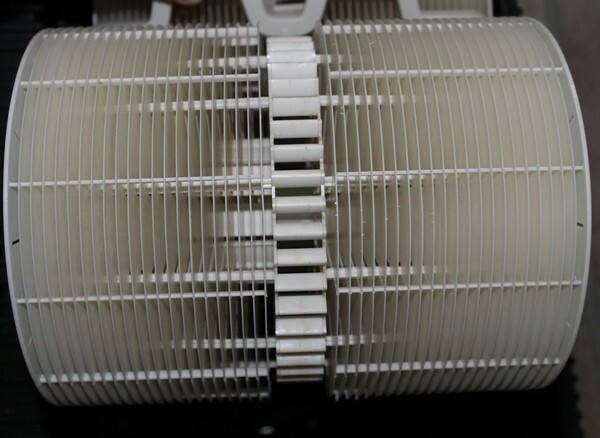 The Venta Airwasher is sending out clean moisture and air particles. It’s just different. The Venta Airwasher is emphatically easy to (I got a thesaurus, trying to use other words aside from “insanely” and “incredibly”). You basically just pop off the top, fill it, add the water treatment, put the top back on, plug it in and turn it on. As if all that isn’t cool enough, Venta is launching a whole new line of Venta Aromatherapy fragrance products this summer that you can add to your Airwasher. I so want those, I LOVE aromatherapy! Basically, those turn your Venta Airwasher into an air purifier/humidifier/aromatherapy diffuser! Neat, right? You don’t need to suffer from allergies to benefit from the Venta Airwasher. Every household has some issues with grungy air. It could be pet dander, itty bitty mold spores or air pollution from city life. We can all use cleaner air. Venta as a company has one mission: to improve the way we breathe. I’d say mission accomplished with the Venta Airwasher! Head over to the Venta Airwasher website to learn more about the different models and decide which one is right for your needs. Follow Venta Airwasher on Twitter and Facebook to keep up with news, and subscribe on YouTube to more videos. My son has allergies, and this Air washing system would be so good to have in our home! The home has so many allergens that need to be removed! I would love to get one of these. Hi Julie! We are so sorry that your son has to suffer with allergies. We know the Venta Airwasher would help alleviate his symptoms and would love to help you! 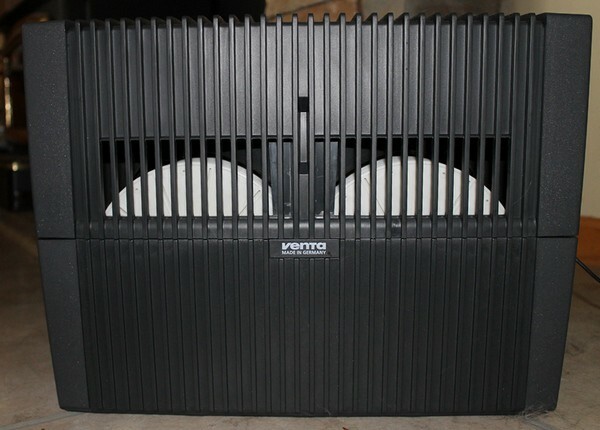 Give us a call toll-free at 888-333-8218 or visit our website (www.venta-airwasher.com). We look forward to adding your family’s success story to the rest of the Venta Family soon! This is Jenny, Marketing Associate with Venta Airwasher. On behalf of Team Venta, I want to say how grateful we are for this wonderful review from Pretty Opinionated and all of the overwhelmingly positive reviews we have been receiving from American consumers. We love helping people and have been the problem solver for the past 30 years. We look forward to introducing everyone in the U.S. to the Airwasher and to perfect indoor air. Any Pretty Opinionated readers who have questions, please feel free to call our toll-free customer service line at 888-333-8218 and chat with one of our friendly Venta Team members!